Journaling? RAID? Vaulting? Mirroring? High availability? Know your data protection and recovery options! 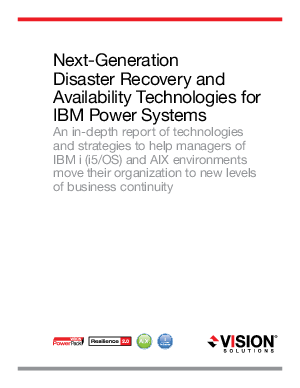 Download this information-packed 29-page report that reviews the spectrum of IBM i (i5/OS) and AIX resilience and recovery technologies and best practices choices, including the latest, next-generation solutions. Use the paper to better evaluate alternatives in light of your own needs and constraints around recovery time, data currency, IT staffing, and budget.